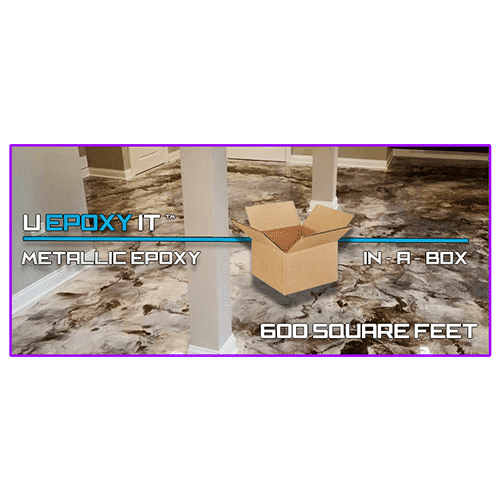 We always get calls with people wanting to know how to apply Epoxy or how to apply metallic epoxy to a floor/project they are working on. And it’s a good thing they do call in, because Epoxy is by far the most difficult concrete finish to do. But it’s difficult because most people just don’t have the know-how on how to apply the Epoxy in the first place. The good news is – this is a really simple fix. And if you bought a Metallic Epoxy System recently, this video page is for you. Before starting Concrete Floor Supply, we were contractors for 9 years and did every kind of project you could think of. That experience gave us the knowledge we needed to advise dozens of contractors, DIYers, big box stores, really anyone who is passionate about doing great work but is a little new to the scene. So today we are going to demystify the process of applying epoxy by giving a 5 part video series (up above) in addition to a step by step walk through on what we discuss there. The first step is mixing. Now, we already went over this in our how to mix floor epoxy series, but we also added the video above. Mixing is fairly straightforward. You are mixing 2 parts of A for 1 part of B, and using an Epoxy Mixing Paddle to fully mix the product. The most important part of this step (notice how we put it in bold? Yes, because it’s a very important thing to consider) is to make sure that after you mix the Epoxy you do not let it sit (again notice the bold). This is important, because most people take a break, etc. Don’t break here, you need to start applying the Epoxy now. This is because as soon as you mix it, the Epoxy will begin to settle and harden, and you risk ruining your work so far. The first part of any concrete finishing project is prep. Keep in mind, your final look will be highly correlated with how you initially prep the floor. This is where Diamond Tools become extremely important. Now, when prepping, be sure to check out the videos on how to prep a concrete floor because it’s going to go into detail about the science behind what is going on. But if you don’t have time for that, what we will say is that the Diamond Tools you use are grinding the surface in a way so your finish will react in the way you want it to. Video #1 shows this. The etches in the ground made by the Diamond Tools are what cause the Epoxy to eventually react and form that metallic look you want it to. For this step, we are using the black base coat. After prep, you will begin to apply the Epoxy that you mixed earlier. Watching the video will give you a very good visual on how to do this. Basically, you want to apply it in strips all along the perimeter of the area you’re going to be working. A good even pour is important here, because it’s going to make your life easier down the line. As your pouring this you want to have your Epoxy Spiked Shoes on, because when you start spreading (next) you will need to be able to move on top of the Epoxy, and spiked shoes make this possible. Now the fun part – but also another difficult part – spreading the epoxy. For spreading next to the wall, you just want to take a little chip paint brush and go along the wall around the area in question. By a chip paint brush, we just mean one like the one in the picture. Again, watch the video because it will make more sense on how to do this correctly, and you want to make sure you do this correctly. For spreading across the main area (the bulk of your project), you will need a serrated squeegee because it’s going to spread the epoxy in the right thickness. You want to get as close to 100% coverage as you possibly can when doing this, because it’s going to make rolling a lot easier. When you’ve finished with the squeegee, you will use a double sided foam roller and go over the area again. With the foam roller, you are filling in all of the areas and making the coat nice and even across the entire floor. Now you could very well be done at this point, and not have any other coats to pour. But for those of you who are putting more on top of the base coat, the 4th video above is for you, and we are going to walk through the extra steps with you now. What we like to do at this point is to go over with a light sanding with a 100 grit sanding screen on the bottom of a floor buffer. This create another little micro profile on the base coat. After that, you will go over the area with a microfiber mop that has Xylene soaked into it. What this is doing is it’s getting every little piece of dust off the area, which more than likely is there since you finished the base coat. Now right after you clean off the base coat, mix your metallic epoxy which we went over in the video at the link before this. You want to do this the same way you did with your base coat, just less. Watch the videos for more information on that. Now pour the Metallic Epoxy over the area in more or less the same way you poured the base coat. A good way to think about this is “Evenly Randomly” meaning you’re going to pour it in strips randomly, but give an even helping to each strip. Then you do the same thing we did above with the Chip Brush and go around the edges with it, getting all the way up to the edge with your brush and epoxy. Now take your serrated squeegee again and cover the area as close to 100% as you possibly can. Don’t worry about how the colors are mixing or anything like that because it’s just going to do what it does, you just need to make sure and spread it around. Once you have this spread evenly across the floor, you can go back through and backroll the product. That was a lot of info, and if you have any questions, leave them below we would love to help out! These videos use a lot of the products we put in our Metallic Epoxy Kit, which you can find at the link below.